Tuesday evening when we visited Pierce Chapel at Wesleyan College for a service, we sat together as a family as the Director of Campus Ministries gave the homily. She talked about how we are called to serve each other, to be the hands and feet and eyes and ears of the One who came to teach us how to love. An empty bowl and a pitcher of water and towels sat at each end of the altar. In the same way that Jesus washed the feet of those who traveled with him, she called us to go up two by two and wash the hands of the one we were with. I watched as my two littles grabbed a hand of one they loved, excited, eager to go up and wash the hands they were holding. My little guy’s mouth was pursed as he focused on picking up the nearly full pitcher and pouring it carefully over his big sister’s hands. He smiled as he “got it right.” He looked up at her and she nodded. He took the towel and helped her dry her hands. I saw the light in our Princess’ eyes and the joy in her smile as she lifted the pitcher and poured the water over my hands in front of her. I think of all who attended the service, the two of them–the only two in the under 18 crowd–were the most enthusiastic and serious all at the same time. But that might just be because I was watching them so intently. The light that came into my baby girl’s eyes when she got to serve, the intensity and focus that my little guy had as he made every effort to serve as called….. I could learn a lot from them. I want to be the hands and feet and not be afraid of getting dirty in my efforts to follow the path of the Rabbi. As I make my way through this week, I am trying to keep my eyes and heart open and learn anew through my children’s eyes and what they see and feel. And how they love. 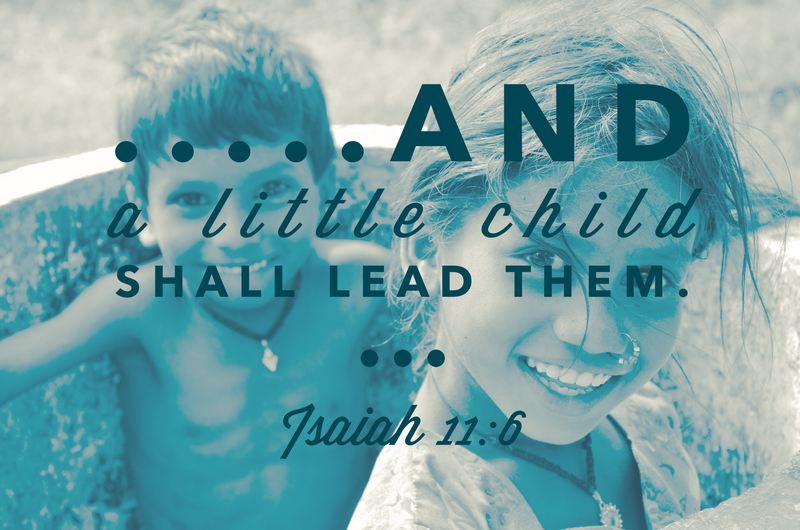 May we all learn to love and serve eagerly with a light in our eyes and joy in our hearts. This evening we had the joy and honor of attending a service in the brand new Pierce Chapel at my alma mater, Wesleyan College. Such a lovely service during this week of weeks. I am thankful for the invitation and that our own Wesleyanne welcomed us coming and being a part of what is now her home, her alma mater. It means the world to me that she doesn’t turn her head and wish we weren’t there. She could, you know. She’s nineteen, so it could go with the territory. But instead she seems glad to see us. Again, my heart is full to bustin’. What I enjoyed most I think was realizing something. As we wandered through quietly before the service began, reading the plates on the back of the seats (Cooter: Are ALL of these seats reserved?! ), I looked down and realized that wisdom can be found most anywhere, if only one is looking. 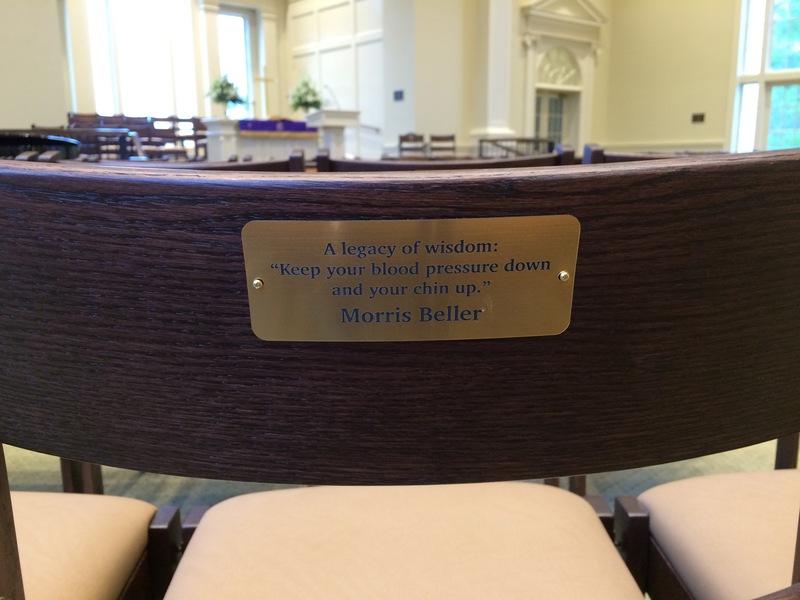 Out of all the chairs and the dedications and memorials–there is, tucked amongst them, this tidbit of wisdom. I laughed a little (quietly of course) and gave thanks for Mr. Beller and his wise words of truth. I don’t know him, but I find it wonderfully fun and delightful to find these words in the midst of all the others. 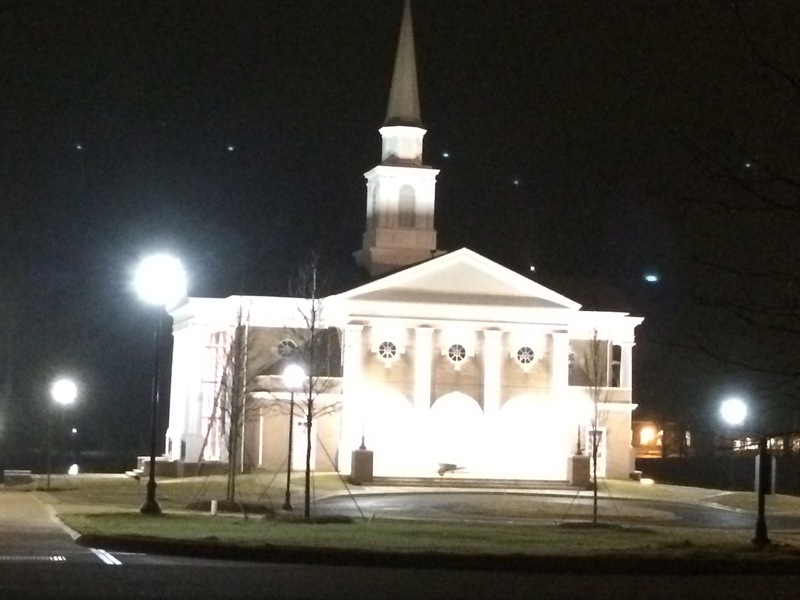 Tonight I leave you with these images of the long-dreamed of and much-anticipated Pierce Chapel. Welcome. And may you stand tall and remind ALL who enter that dreams can and do come true. In time. And may ALL who want to enter always be welcomed. And loved. 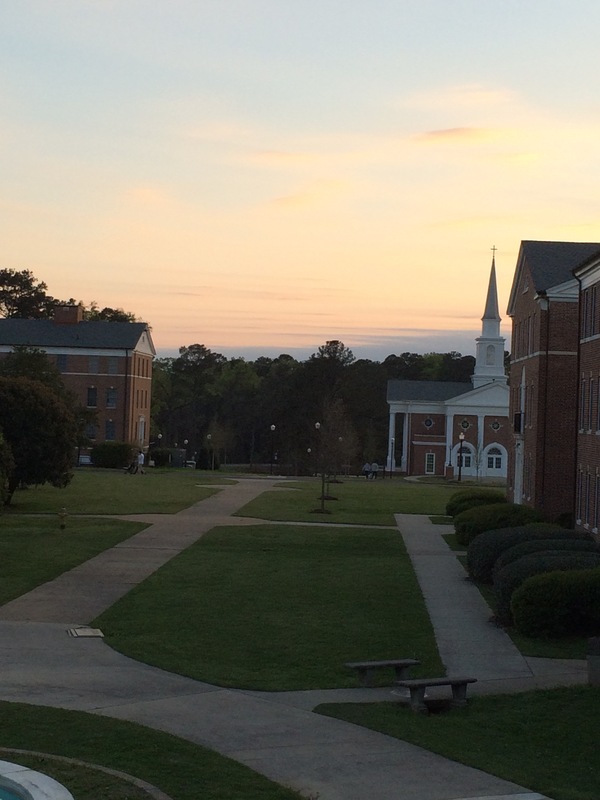 A view of Pierce Chapel from the loggia when we visited for the Party on the Green Sunday evening. Beautiful, isn’t she? 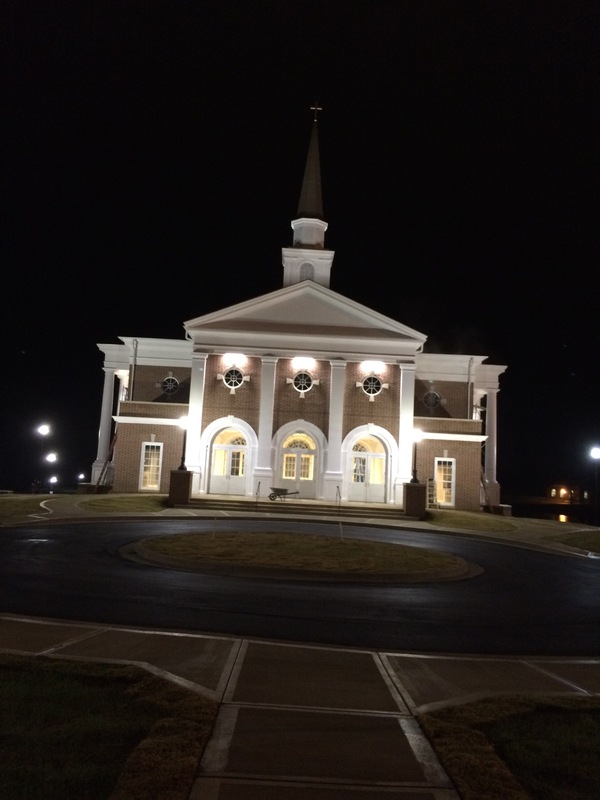 Pierce Chapel shining brightly when Cooter and I attended “Ain’t I a Woman” two weeks ago. And one more shot, simply because I love it.